...: If the Shoe Fits. Calling all ladies with an 8 1/2 size foot in Nashville. 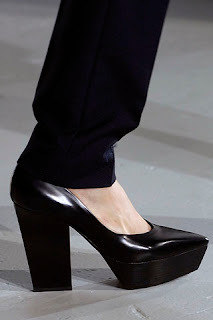 I stepped into UAL on Monday to check out their new goodies, and the sweet sales lady pulled out a pair of Jil Sander stacked heels from the fall 07 collection. They are slightly damaged, but such an easy fix. They are selling for a whopping $50 when the original price is something near $800 So if you want a museum quality shoe go go go!! Too bad I wear a 6 and a half (teeny feet). A Tennessee shout out to you! I am in Memphis. Oh but you are lucky because there are always the cutest shoes in smaller sizes! UAL always has the best shoes in 5 and halfs and sixes.